Anybody notice, there are no more wireless UI devices available to purchase plus no more T-Stats.....beginning of the end? Or perhaps just a new long over due revamp...hoping for the latter. Hard to say. Its hard to compete with China, so I'm not surprised we aren't seeing new wireless touch panels with TPC available. It doesn't really make sense to try and compete on hardware with Apple, Google, etc making millions of devices overseas that come with a monthly revenue stream from the phone. I have clients that would likely buy AMX wireless touch panels, as they are not enamored with the iPad but they are fewer and fewer as time goes on. I think a good remote is where they might be more opportunities, but I don't think AMX is too interested in them these days. I think a good remote is where they might be more opportunities, but I don't think AMX is too interested in them these days. not many people I come across don't want to hold an iPad to control a TV. Certainly an iPad can be bulky. But Using an old phone or android can make a damn fine handheld remote with TPControl at half the price. 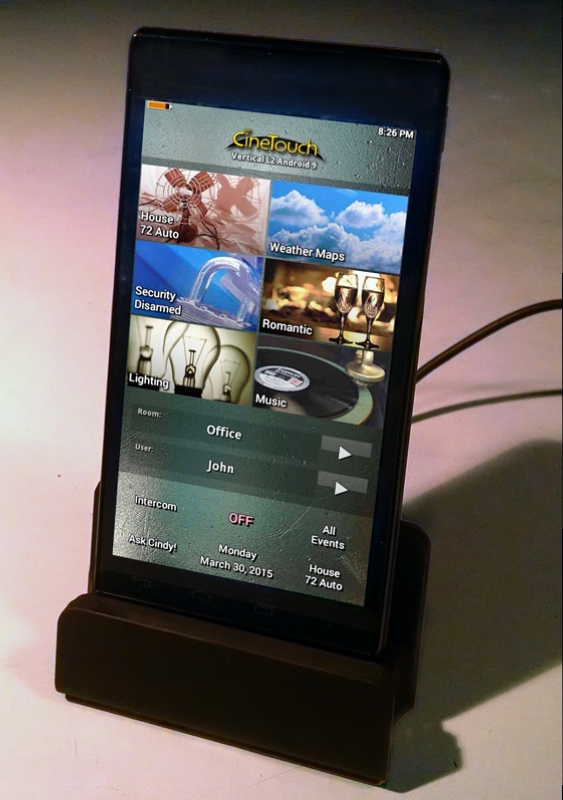 Pictured, a $25 phone in a $6 dock. If you simply must have hard buttons, which sometimes you must, any universal IR remote works fine with AMX codes. I've seen pretty nice touch/hard projects on URC and RTI that talk RF and/or IR to AMX. While this may be less than you want, it's far more than you imply. I've found how the whole wireless control thing has played out fascinating. Not unlike a chess match, the checkmate occurred 8 moves ago but the game had to be played out to see it's end. The ability of the iGadgets and Surfaces to get their parts cheaper in orders of magnitude than the control companies, combined with the seemingly legions of engineers and programmers at their disposal pretty much made creating a wireless TP that would make any sense at all pretty much impossible. Similarly, tring to sell a hand-held remote for over $1,000 that is functionally the same feature set as the one of several flavors available out there for less than $200 each cannot be sustained. I think this is just symptomatic of what happens when a manufacturer that is essentially existing in a niche market tries/is forced to migrate into the mainstream product-wise. I think it does two things (and history kinda bears this out) 1) it forces you to devalue what you do by virtue of the obvious and eventual comparisons by the consumer. and 2) It also seems to draw the attention of the giant you've suddenly become visible to - which same said giant can easily reach over and gobble you up. Well put Eric. And sad, after this layoff thing I am firmly sure that will be very few AMX systems left to program. Prior to that I was still holding on tight just hoping and wishing. What $200 remote are you referring to that has all the features an R4 has? Cars all basically have the same functionality, they get you from A to B. Yet people buy Bentleys, Porsches, Audis, BMWs, etc for a lot of money knowing they can't even legally drive them like they have been designed to be driven. And what do many do once they have the car? They spend more money customizing it, so its different than all the others on the road. So I don't think you can look at things that way, otherwise we'd all be driving Honda Civics, and using URC remotes. Perhaps a bit hyperbolic on my part. But, the same basic features of graphics, feedback and so forth can be achieved by most the popular brands like URC and all that. I still maintain a couple orphaned Resi systems built entirely on URC hand helds that output rs232 to the AMX controller. They sport graphics and feedback. I think (but don't know for sure) that they were retail $350 each. Those 2 way remotes with color screens are usually about $500 and don't usually offer a touch screen. Any savings in hardware is usually made up for with increased programming costs though. I've done RTI remotes with AMX and while they worked for the most part, were not ideal and required a lot of extra programming. We did it back then because there was no R4, but I wouldn't do it now since it takes a lot of extra time. RF had its issues with multiple remotes using the same frequency. Interesting how this thread seems steering toward the irrefutable requirement of a touch screen, while the last time remotes were discussed here, the obvious missing thing that would save AMX was hard buttons. It's almost as though there is no one simple answer! Also just noticed, Octaire is gone too. Who is everyone getting large scale (around 30 x 48) audio switchers from? Not being in resi, but helping a few dealers who do - Seems to me they are all moving away from centralized audio and more towards just plopping media servers like Sonos and iWhatitz in a few key rooms and handing them a remote or iPhone app. I honestly cannot remember the last time I saw a large matrix audio switcher anywhere. I honestly cannot remember the last time I saw a large matrix audio switcher anywhere. That is all I do, is large scale resi systems, 32 zones is average. Combining audio and video sources into the room's audio speakers, plus options for headphones...this could not be done using Sonos or any other "out of the box" solutions. I am thinking I'll be needing to go with Extron, but wondering what other people are using...surely I can't be the only one still doing large resi audio and video systems. Back in my Resi days we did use AutoPatch and Extron for larger systems. (over 32X32) I still have a smaller distributed system in my home that we still use all the time. It's an Autopatch.